What makes the Adidas Box Hog 2 stand out? It is safe to say that the Adidas Box Hog 2 boots are a perfect option for both amateur and professional boxers, with plenty of fans on both sides of the scale. They enable your feet to move easily across the surface of the ring without a problem. While still offering a good amount of ankle support and allowing your feet the space that they need to breathe. The material of boxing boots is really important. One of the main differences between the Adidas Box Hog 2 and the Adidas Box Hog is the material, as these shoes feature a new type of mesh. The mesh itself is light, breathable, and comfortable. This makes them better than the originals, despite that the original shoes were one of the best-selling boxing shoes in the whole of Europe. It can be difficult for designers to get the design of the sole on boxing shoes right. They need to grip the boxing ring, but they also need to be mobile enough to change direction nice and quickly. The gum rubber outsole offers that by providing enough traction to grip the ring nicely, but not to keep you stuck in one spot as if your feet have been cemented to the floor. One of the things that you have to consider as a boxer is whether you want to go for lower cut shoes or high-top boots like the Adidas Box Hog 2. Most people find that lower cut shoes are more comfortable, but they do not offer the same amount of ankle support that can be found with high-top boots. Ankle support is important in the ring, and this particular set of boots offer that support without being too cumbersome. The fact that the Adidas Box Hog 2 boots are so lightweight is what makes them stand out from the crowd. As a boxer, you need to be able to move your feet as quickly as you can. You also need to be able to change direction as quickly as you think that you might need to change direction, without even a second of hesitation in between. Boxing shoes themselves have actually been specifically designed to weigh less than standard athletic shoes. If they were as heavy as athletic shoes, boxers would not be able to move quickly, and this would result in slow direction changes as well as slow stance changes. When you’re out in the boxing ring, the weight of your shoes should make you feel like you aren’t wearing any. You also have to consider the fact that standard athletic shoes, like running shoes, have a lot more traction than boxing shoes. When you have to pivot as a boxer, running shoes would simply prevent the smooth rotation of your foot from even occurring. Wearing shoes while you are boxing is a choice, but most boxers find that their footwork quickly improves when they do. The high-top boxing shoes somehow manage to enable you to do this while also offering a huge amount of support to your ankles and lower shins. Adidas never fail when it comes to producing high-quality products. This particular pair of boots does everything that a boxer needs a pair of boots to do. They allow your feet to pivot and move easily across the surface of the ring, while still having enough traction to prevent you from slipping. They also have the right type of material, that proves itself to be incredibly lightweight and flexible. But it still hugs your foot and allows it to breathe so that any moisture can quickly escape. All in all, these boots stand out as the sort of boxing boots that you would expect from a company like Adidas. 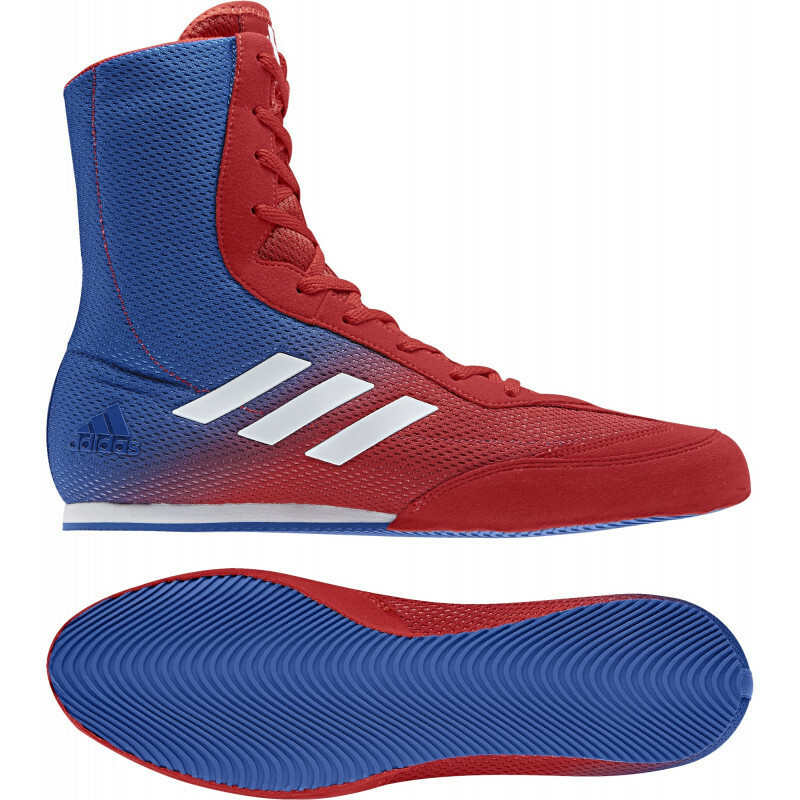 They have the typical Adidas flare and the ability to hold up well when used in general boxing workouts. Even their lightweight nature makes footwork feel like a breeze.